Assess design strategies related to creating buildings that can be innovative in shape and form and meet structural and fire code requirements. 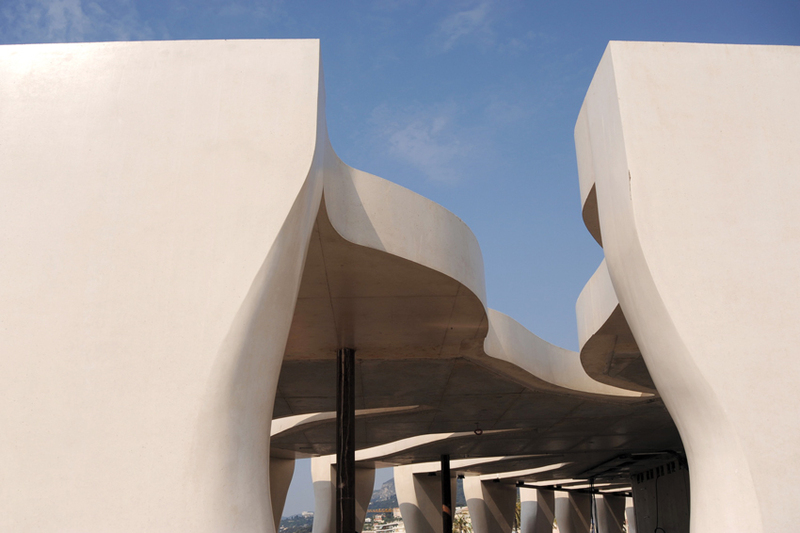 Concrete is a rather ubiquitous, tested, proven, and versatile building material. It has been used for literally thousands of years to create long-lasting man-made structures of all types, including buildings. Architects in the past few centuries have found it to be an appealing choice to express dynamic and vibrant designs in ways that other materials could not. The ability to structurally reinforce concrete and form it into custom, free-flowing shapes can give it an organic quality that is different from most other materials. This can produce more design freedom and the ability to incorporate unique and custom features into a building as part of the basic construction process. It is not surprising then that new technologies, techniques, and design approaches have been developed that allow architects to think and design with concrete in ways that are even more creative, structurally efficient, sustainable, and cost effective. It is also common to couple the technical knowledge of concrete with the ability to design in three dimensions using building information modeling or similar design software to create award-winning and stunning facilities. Some architects even attest that their careers have not only been made possible but have flourished through this combination. Architectural concrete is a versatile building material that can provide structure, enclosure, and finish with exceptional design flexibility. Concrete has long been regarded as a remarkable material that is extremely plastic and malleable when newly mixed but exceptionally strong and durable when cured and hardened. These properties come from the fact that it is a man-made combination of some very common natural ingredients that give it these characteristics. Gravel or crushed stone: This is the coarse aggregate that makes up the majority of concrete and is fundamentally the source of its strength. Aggregate can vary in type and size and, for practical reasons, is usually sourced locally for a particular project where it is being used. Sand: This is the fine aggregate that serves the purpose of filling in the spaces between the coarse aggregate. The ratio of fine to course aggregate can vary depending on the specific concrete mix and the intended final use or appearance of the concrete. Cement: While some in the public mistakenly use the term cement when they mean concrete, design professionals are quite aware that cement is just one ingredient of concrete. This is the paste that coats the aggregate with the ability to bond or hold it all together and is typically on the order of only 10 to 15 percent of a concrete mix. While made from natural materials, cement, specifically often portland cement, is a manufactured product that may be shipped in from elsewhere. It is a controlled chemical combination of calcium, silicon, aluminum, iron, and other ingredients. Common raw materials used to obtain those chemicals include limestone, shells, and chalk or marble combined with shale, clay, slate, blast furnace slag, silica sand, and iron ore. These ingredients, when heated at high temperatures, form a rock-like substance that is ground into the fine powder that we know as cement. Different combinations of ingredients can yield different bonding strengths as well as different colors of cement. Water: The above materials are all dry and by themselves will not interact to form concrete until an appropriate amount of clean, potable water is added. The hydrogen and oxygen in the water create a chemical reaction called hydration with the chemicals in the cement that allows it to transform and bond all of the aggregates together. As a significant and important chemical ingredient, water may account for 15 to 20 percent of the concrete mix. Air: As with any mixing process, some air is inherent in the process of creating concrete. The amount of air can affect the physical properties of the concrete and can be controlled somewhat but will commonly be on the order of 5 to 8 percent of the mix. Understandably, varying the type and proportions of ingredients will determine different basic characteristics of the concrete, including its overall strength, appearance, color, texture, and the corresponding suitability for different applications. In recent decades, chemical admixtures have been developed that can be added to further influence the final characteristics of concrete. Putting all of these ingredients together didn’t just happen by accident so it is amazing to realize how long people have been using concrete as a building material and how it has been adapted and developed over time. The earliest known use of rudimentary concrete dates back to about 6500 BC in the Middle East (current day southern Syria and northern Jordan) by Nabataea Bedouins who controlled oases in this desert area. They were interested in creating places to store water and found they could mix lime with some local deposits of silica sand and pozzolan (sandy volcanic ash) to create a rather waterproof enclosure. They used a very dry mix of materials with only a little water and would tamp it into place by hand to make it more gel like, producing greater bonding. Around 3000 BC, ancient Egyptians began to use lime mortars that were similar to concrete in the building of the pyramids. These mortars held the stone and bricks of the pyramids and other structures together but were also placed first as a bedding material for cut stone and bricks. This concrete-like bedding allowed some of the stones to be carved and set with extremely thin joints no wider than 1/50 of an inch. Around the same time, the Great Wall of China used a form of cement and mortar in and around stone and brickwork. Modern day spectrometer testing has shown that a key ingredient in this mix was glutinous sticky rice among other things. By 600 BC, the Greeks had discovered a natural pozzolan that formed cement when mixed with lime and water and used it somewhat selectively for buildings. The Romans by contrast were very prolific with concrete, although they often used a drier, less plastic version than the Greeks. Initially, this mixture was used more as a means to hold large stones and bricks together. For larger and grander structures, the Romans began to incorporate volcanic sand to react chemically with lime and water, causing hydration and allowing it to cure beautifully under water. This likely represented the first large-scale use of a truly cementitious binding agent as part of concrete and was a part of utilitarian structures like aqueducts, bridges, etc. It was also used for significant buildings, many of which are still standing today, such as some Roman baths, the Pantheon in Rome, and the Colosseum. There was also some experimentation with admixtures, such as animal fat, milk, and blood, to adjust the physical properties of the concrete mixtures. When natural pozzolan aggregate was not readily available, the Romans seem to have learned how to manufacture two types of artificial pozzolans, which reflected a fairly high level of sophistication for the time.